Keeper takes a minimalist design approach to securing your passwords and other sensitive data online. But don’t mistake that for a minimalist approach to security—it has a full suite of state-of-the-art tools available to protect against hackers. Its combination of ease of use and high functionality has won numerous awards including an “Editor’s Choice” pick on the Google Play store, as well as the GTB Telecoms Consumer Service Innovation Award. Keeper has three different plans for users with different needs. A Family Plan is also offered, which has the same functionality + the addition of 10GB of secure file storage. It costs $59.99/year and can be assigned to five different accounts/users. In addition, there are optional add-ons for secure file storage as well as dedicated onboarding and training. For desktops and laptops—including Mac, PC, and Linux operating systems—there are two installation options. You can download Keeper natively to your computer, set up your vault, and be up and running in a matter of minutes. Or, if you don’t want to download the program, you can instead add it as a browser extension. For cell phones and tablets, you can go to the website and ask to have a link sent to your email box which can be used to quickly find the app. Otherwise, you can head over to your device’s app store directly, search for Keeper, and download. Once Keeper is installed on any desktop, laptop, or device, your login credentials will be automatically inputted into every site for which they are saved. When you visit a new site or want to change your credentials, Keeper will prompt you automatically to do so; you will never have to go “searching” for your information. Your master password remains entirely private to you at all times (Keeper has no way of knowing it, even if you forget it). In addition, your device has a unique encryption key that identifies it as yours; this means that someone trying to hack your vault from a device not registered to you will be completely locked out. Keeper uses 256-bit AES encryption and PBKDF2 to encrypt data. Another layer of security is added via multi-factor authentication. This is done via biometric indicators such as your fingerprint, or the use of a second device such as a smartwatch that you have registered in order to confirm your identity. Unlike other services where you might need to pay extra for higher level, real-time support, Keeper offers a full array of support options for everyone. There is the usual FAQ section, but it’s supplemented by a selection of webinars that go more in depth. There are also email and live chat options on the website, as well as a customer support number to speak with a representative. 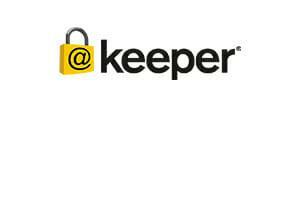 Keeper has a well-developed security layout, with impressive multi-factor identification tools and data backups to keep your information safe. The customer service options are also very welcomed; it’s an area that many other password management companies neglect. But there is no getting around the fact that for businesses, Keeper’s cost is on the high side. While there is a lot of good functionality, there isn’t anything so spectacular as to justify such a steep derivation from the competition. Bottom line, if you are an individual or family, Keeper is both secure and reasonable from a cost perspective. But for companies and large organizations, you’ll probably want to look elsewhere. Is it possible to keep your vault on your own computer, rather than trust it to the cloud? Keeper explains their reasoning for having the cloud option here: “The cloud component of our product is purely for the synchronization of encrypted data syncing and access controls. You can restrict platforms, locations, control every aspect of the usage model.” Hope this helps.